Former Confederate Quartermaster clerk Charles F. Jarrett, of Hopkinsville, Kentucky, brought an iron paymaster’s chest home from the Civil War. The chest survives. A similar paymaster’s chest is at the Smithsonian. 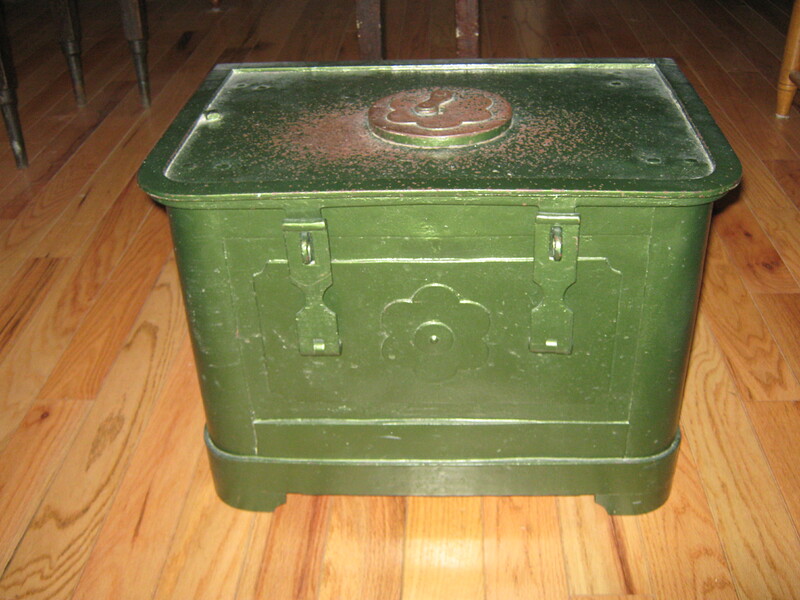 Civil War pay boxes were well constructed to protect their contents from theft and the elements. Mr. Jarrett was initially a clerk in the Quartermaster Department of the 3rd. Regiment, Kentucky Mounted Infantry. He was later promoted to Provost Marshal of Lieutenant General Nathan Bedford Forrest’s military court. The Charles F. Jarrett paymaster’s chest became part of Mr. Jarrett’s estate when he died in 1923. His widow, Susan McComb Jarrett, gave it to John W. “Jack” Saturley, a Hopkinsville painting contractor, when he painted her home c.1923-1925. She told him that her husband had used the payroll chest during the Civil War. Mr. Saturley stored it in an outbuilding on his farm just North of Hopkinsville. Mr. Saturley died in 1944. The paymaster’s chest went to his son John B. “Johnnie” Saturley who used it for a tool box. The latter gave the Civil War relic to teenage neighbor, Roger Futrell, in 1958. Futrell loaned the strong box to the Jefferson Davis State Park at Fairview in 1959; Park Superintendent Idell D. Johnson displayed it in the observation area atop the obelisk. She returned the chest to Futrell shortly before she left her post with the shrine in 1960. Paying America’s rival military forces during the Civil War was no simple matter. Paymasters on both sides handled the task. The Union utilized its centralized pay system already in place. Union paymasters reported to the US Paymaster General’s pay department. The Confederate States did not have a consolidated system. They delegated their pay function to individual Quartermaster departments. Rebel paymasters, who were frequently called “pay clerks,” reported to their regimental commands. The U.S. Paymaster General’s office had 25 paymasters on board when the war broke out. President Lincoln appointed 562 “additional paymasters” to handle the task. Those paymasters traveled with the forces as they navigated the conflict. The Union pay system was inept from the outset. Major General Benjamin W. Brice overhauled the agency when he took command in late 1864. He required that paymaster candidates be physically fit and have a basic knowledge of accounting. J.H. Eaton, one of the “added” paymasters, compiled a paymaster’s manual that defined military pay policy in 1864. The Union and Confederate armies seldom received their pay on schedule. Union soldiers were lucky to get their money every four months even though they were supposed to be paid bi-monthly. The Confederates were even slower in settling with the troops. US privates earned $13 per month until their pay was increased to $16 monthly in June 1864. The Confederacy’s pay structure was similar to that of the Union. Privates received $11.00 a month until June 1864 when enlisted men were given a $7 per month across-the-board raise. The Confederate dollar quickly lost value. Paymasters were typically well educated; they frequently wore multiple hats. They primarily worked as accountants and functioned more like civilians than soldiers. Paymasters needed few supplies to get the job done. They simply needed a pay chest with cash, a work table, and a folding chair to pay the troops. They often performed additional duties including maintaining muster rolls, service records, and casualty reports. The legacy of the Charles Jarrett pay chest is supported by both oral tradition and Mr. Jarrett’s compiled military service record which confirms that he was once a clerk in his regiment’s Quartermaster department. Affidavit of John B. “Johnnie” Saturley (2114 Fourth Avenue, Tucson, AZ 85714), Jan. 19, 197l. Affidavit, Saturley, 1971; Affidavit of Roger H. Futrell (533 Winston Way, Frankfort, KY 40601), Nov. 25, 1986. Lon Schleining and Randy O’Rourke, Treasure Chests: The Legacy of Extraordinary Boxes (Newtown, CT: Taunton Press: 2001), 32. C.F. Jarrett, Compiled Military Service Records…Confederate Soldiers…Kentucky, (3rd. Regiment, Kentucky Mounted Infantry), micropublication M377 (Washington: National Archives), roll 7; “C.F. Jarrett…Is Dead…Served With Forrest,” Special to Courier-Journal, Oct. 28, 1923, 2. Charles Fergerson Jarrett, death certificate no. 051-25230 (1923), Kentucky Bureau Vital Statistics. John B. “Johnnie” Saturley, conversations with Roger H. Futrell, 1958; Affidavit, Saturley, 1971. John B. “Johnnie” Saturley, conversations with Futrell, 1958; Affidavit, Saturley, 1971; Susan McComb Jarrett, death certificate no. 043-21067 (1925), Kentucky Bureau of Vital Statistics. John B. “Johnnie” Saturley, conversations with Futrell, 1958. “J.W. Saturley Dies At Home Here Friday,” Kentucky New Era (Hopkinsville, Ky., July 22, 1944); “Harry Saturley,” painting advertisement, Kentucky New Era, August 23, 1944; John B. Saturley, conversations with Futrell, 1958; Affidavit, Saturley, 1971. Affidavit, Saturley, 1971; Affidavit, Futrell, 1986. William C. Moffatt, Jr., “Soldier Pay,” The Cincinnati Civil War Round Table (January 1965). “Records of the Quartermaster Department,” War Department Collection of Confederate Records, Record Group 109.7.3, National Archives. “President Abraham Lincoln, Building Up the Union Army,” RAAB Collection.com. “Payroll in 1800s America,” Sure Payroll; http://blog.surepayroll.com/. Mark Mayo Boatner III, The Civil War Dictionary (New York: Vintage Civil War Library, 1991). “Civil War Paymaster Chest,” History Wired; www.historywired.si.edu. The History of Payroll in the United States. Ronald S. Coddington, “Walt Whitman’s Boss,” Opinionator, The New York Times, March 22, 2013. This entry was posted in Common Soldier, Leadership--Confederate, Leadership--Federal and tagged Benjamin Brice, Charles Jarrett, J.H. Eaton, Nathan Bedford Forrest, U.S. Paymaster, Walt Whitman. Bookmark the permalink. Thank You for compiling this information very interesting .